The Cordelian Club Dance will take place at the Springville Volunteer Fire Dept. Hall on West Main Street from 7-11 p.m. on Saturday, March 2. 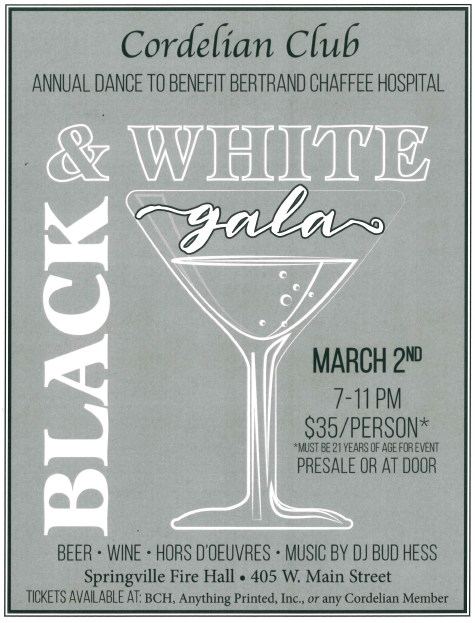 You must be 21 or older to purchase tickets or attend; tickets are for sale at the BCH front desk, Anything Printed, or from any Cordelian member. Proceeds support the BCH Foundation! Tickets are $35 per person.